The newly opened Museum of the Bible is only one of a growing number of museums, theme parks, and other public attractions focused on the Christian scriptures. Anthropologist James Bielo’s “Materializing the Bible” project is an excellent source of information about such endeavours. According to his January 2018 update, there are some 466 venues in over forty countries, but over half are in the United States. Of these hundreds of sites, there are approximately three dozen so-called creation museums and related facilities, most of which are in North America. Fig. 1. A view of the AiG Creation Museum from its botanical gardens. Photo by the author, Oct. 5, 2015. The Answers in Genesis (AiG) organization operates the two largest: the “Creation Museum” (opened 2007) and the “Ark Encounter” (opened 2016). Both venues benefit from biblical and other artifacts loaned to them from the Green Collection of biblical antiquities and the Museum of the Bible (MOTB). In 2012, Steve Green, MOTB’s board chair and a founding visionary, opened the Verbum Domini exhibition of rare biblical manuscripts at the Creation Museum, saying that, “I have visited the unique Creation Museum twice now … and I am pleased this excellent museum can be enhanced with our Verbum Domini exhibit.” This was only the first of a rotating series of exhibits from the Green Collection and the Museum of the Bible hosted at the Creation Museum. The Ark Encounter also features an MOTB exhibit. In turn, Ken Ham, the CEO of AiG, was invited to the grand opening gala of the Museum of the Bible in Washington. The issue that concerns this paper is not how the MOTB lends credence to creationist claims, although this must be addressed to some extent, but how the MOTB becomes party to a disturbing misrepresentation of Jews and Judaism at the AiG attractions. I argue that the MOTB is aiding AiG to display a callousness toward Jews and that this undermines claims the MOTB makes about its support for religious and cultural inclusivity and its scholarly mission to understand the contexts of the Bible’s production. Jewish transmission of Torah is upheld by AiG as demonstrating the antiquity and reliability of Genesis. Numerous examples of Judaica help evoke a nostalgia for an imagined ancient world in which Jews represent a bygone age and serve as foils and paradigms in a rhetoric of creationist legitimization and Christian restorationism. Even fairly recent Torah scrolls are employed to depict an idealized Jewish repentance and faithfulness in pre-Christian times that becomes a paradigm for a modern Christian revitalization effort. As I will discuss below, Jewish tradition that developed from the Second Temple period onward, however, is depicted in some of the Creation Museum signage as corrupt, heterodox, and at least partially to blame for the crucifixion of Christ. To AiG, the work of the ancient rabbis represents the replacement of the divine Word with human knowledge, the sin that led to the fall of humanity. The historic persecution of Jews provides AiG with a self-justifying analogy for creationists who defend the Bible against the hegemony of scientific and secular discourse and the compromises of a liberal church. Avoided, however, is any implication of Christian antisemitism at the AiG attractions. Instead, the “evolutionary worldview” is projected into the original sin in the Garden of Eden which only later becomes a Darwinian science that directly influenced Nazi antisemitism. At its early stages of development, it seemed as if the MOTB was intended to fill a role far more in line with AiG’s agenda than its current mission statements would suggest. Candida Moss and Joel Baden observe that, at first, the museum was, “to bring to life the living word of God, to tell its compelling story of preservation, and to inspire confidence in the absolute authority and reliability of the Bible.” By 2012, however, this was changed to, “invite people to engage with the Bible through our four primary activities: travelling exhibits, scholarship, building of a permanent museum, and developing elective high school curriculum.” The statement from the following year mentioned the use of “museum exhibits and scholarly pursuits” to let people engage with the Bible. This late interest in “scholarly pursuits” stands in sharp contrast to the intentions of AiG. Answers in Genesis’s totalizing approach to scripture holds that the universe is only around 6,000 years old and was created in six 24-hour days. The AiG venues assert in many places that before the sin of Adam and Eve brought death into the world, there was no disease, pain, or suffering. All animals, even velociraptors, were vegetarian. Dinosaurs did not go extinct until after the flood. All flood myths are corruptions of the memory properly preserved in the Bible. All people spoke the same language until the Tower of Babel was abandoned only a century or so after the deluge, which AiG dates to around 2350 BCE. It is only after this that the pyramids were built. According to AiG, before the deluge, all land was “gathered together” in one great mass and the flood was responsible for continental drift. At the time of writing this essay (January 2018), the current MOTB special exhibition at the Creation Museum deals with the “Dragon Slayers”, Saints Michael, George, and Margaret. While medieval artifacts relating to legends of these figures could make a fascinating exhibit, AiG is not really interested in the saints but in purportedly corroborating evidence that biblical references to Behemoth and Leviathan refer to dinosaurs that coexisted with humans. One Creation Museum sign declares “Not the Stuff of Legends: The Bible is Authoritative, Without Error, And Inspired by God. While dragon legends may be fanciful retellings of actual events, God’s Word tells us about two dragon-like creatures.” The “Pre-Flood World” gallery at the Ark Encounter has a diorama showing a gladiator battling a dinosaur. On the surface, the MOTB denies the young Earth creationist view of world history and refuses to collapse the history of the ancient Near East into the period after the biblical flood. For instance, one of its displays speak of the cultures in the Fertile Crescent between 3200 and 2600 BCE and there are no references to dinosaurs roaming the land at that time. Noah’s flood does not appear as a historical event nor is the origin of all languages attributed to a failed tower project in Babylon. MOTB’s partnership with AiG, then, seems hard to explain if the academic approach to the Bible and ancient history really is a primary goal of the Washington museum. The “Scholars Initiative” program of the MOTB “fosters biblical research at colleges, universities, and seminaries across the word, planning and supporting academic projects related to the languages and material culture of the Bible, and capitalizing on artifacts in the Museum Collections.” None of this transfers over to the AiG use of MOTB materials. As a young Earth creationist ministry, there is little place in AiG’s mission for scholarly discussion about the Bible. The ministry affirms a strict creatio ex nihilo doctrine and never questions the traditional English rendering of Gen. 1:1-3. This position could not be challenged by philological argument or comparison with other ancient Near Eastern cosmologies that suggest Genesis is best understood as telling of creation from some form of primordial matter. This would be putting human knowledge ahead of the plain meaning of divine revelation. Examples of Israelite material culture are not on display to illustrate life in the ancient world. Rather, they help evoke the reality of the biblical past imagined by the ministry and to legitimize their own claims of having the proper understanding of the Bible. Fig. 2. “Authentic Pottery from Israel”. This Creation Museum exhibit features artifacts from the Middle Bronze Age to the Herodian Period. The placard says in part, “If you look closely you can see that some still have the potters’ fingerprints on them. It is possible that the people who made them actually saw Joshua, Ruth, David or even Jesus himself.” These artifacts are not attributed to the Green Collection or MOTB. Photo by the author, Oct 2, 2015. A significant part of the Young Earth Creationist mission is to call Christians back to so-called “Biblical Christianity.” For AiG, the Bible is the Protestant Canon and has a single message. 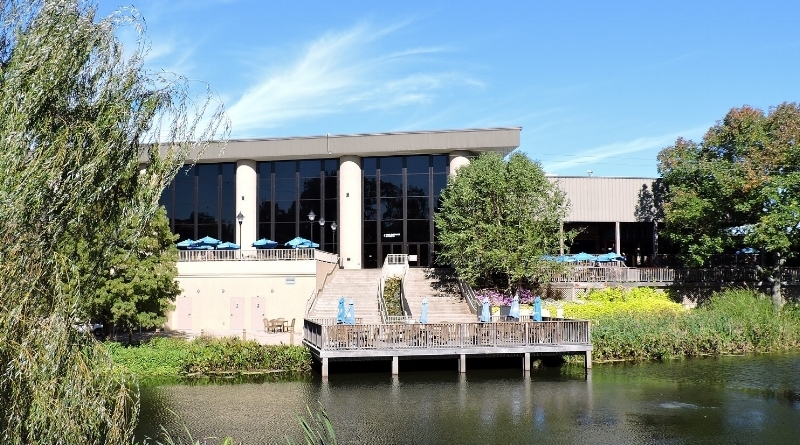 One exhibit at the Creation Museum affirms the perfect transmission of the divine Word through the ages, citing the discovery of the Dead Sea scrolls and thousands of New Testament manuscripts as proof. The Bible is infallible on all subjects it discusses and is internally consistent. Answers in Genesis celebrates Martin Luther and his doctrine of sola scriptura. The polemic against “compromised” Christianity that rejects AiG’s interpretation of scripture is particularly harsh. In their museums, AiG makes little distinction between Catholicism and liberal Protestantism. An AiG edited volume, however, is particularly harsh on Catholicism. Besides denouncing papal support for evolution, Terry Mortenson describes Catholicism as a “false church that enslaves hundreds of millions of people.” Moss and Baden observe that the AiG media release announcing the arrival of the Verbum Domini exhibit at the Creation Museum “leveraged the prestige of the exhibit’s previous location” at the Vatican. My reading of the wording of the announcement’s subtitle, “‘Moving From the Vatican to the Bible-Upholding Museum,” however, is that AiG is affirming its brand of Protestant “Biblical Christianity” over Catholicism. One sign at the Creation Museum claims that each biblical book was recognized as canonical from the moment it was composed (this, of course, excludes the Apocrypha). Reading further, one learns that the Hebrews were the Old Testament’s custodians who accurately copied each word. The word choice is telling. As “custodians”, Jews never really owned the texts. They were destined for Christians. Turning to the New Testament, the sign repeats much the same language, saying that, “Followers of Jesus Christ carefully copied each word from one generation to the next”. Christians, then, have superseded Jews as the carriers of the divine word. AiG and other creationist ministries affirm the accurate wording of the Christian Old Testament, often by appealing to Jewish scribal precision but Judaism itself is relegated to a “human tradition” that is ultimately corrupting of God’s Word. There is little room here for the cultural sensitivity that the MOTB’s International Advisory Council is meant to ensure. Creation museums are significant resources for the young Earth creationist community that sees itself threatened by compromise with the larger society and secularism. A number of excellent dissertations have been completed over the past few years that examine how creationists appropriate the genre of natural history museum to generate scientific authority. The MOTB’s presence in such places surely contributes to the confidence many patrons have that the creationist reading of Scripture is true and that its portrayal of history—including that of ancient Israel and Judaism—is accurate. As Jeffrey Steller argues, a believer’s visit to the AiG venues can take on the character of a transformative pilgrimage. He calls attention to the Creation Museum’s slogan, “Prepare to Believe.” Labelling the AiG museum a “spatial sermon”, John Lynch likens its rhetoric to the conversion narratives so popular in evangelical culture. The patron moves from galleries displaying the breakdown of society to one evoking the Edenic paradise, a transformation from death to rebirth. The MOTB material certainly assists in this regard by providing an ostensibly authoritative presentation of the Bible and antiquities that affirms the creationist world view and the need for a personal encounter with the god of the Bible. My own visits to The Ark Encounter reveal a similar pattern. A “voyage” on the ark begins on the dimly lit lower deck crowded with rows of small cages while sounds of terrified animals and a storm are played on the sound-system. It progresses upwards, and soon the animal and storm sounds are gone. On the top floor, one finds the open and palatial quarters of pious Noah and family, isolated in salvific luxury from the terrifying world outside, away from the galleries of cramped animals and the filthy work of carrying for them. Human animality is replaced with relaxation, fellowship, and contemplation. The pilgrimage ends with a gallery featuring a conventional theodicy and conversion story in the form of a giant graphic novel. Fig. 3. Part of the crew quarters at the Ark Encounter. Depicted here are Noah’s son, Ham, and his wife, to whom the artists gave the name Kezia. Naming the characters and providing backstories humanizes them. Note also that Kezia is depicted with dark skin and other features associated with African ancestry. Important in AiG’s ideology is that all human physical differences were already present in the earliest human populations, as part of God’s plan to create a single human species. Photo by the author, Aug 2, 2016. Fig 4. A 19th century Persian Torah Scroll on an early 20th century Reading Table from Poland, at the opening of the MOTB Voyage of a Book exhibit at the Ark Encounter. Photo by author, Aug. 2, 2016. The top floor also hosts the Voyage of a Book exhibit supplied by the Museum of the Bible that chronicles missionary efforts to disseminate the Christian scriptures. The exhibit opens with a prominently placed glass-encased Torah scroll but this only serves a supersessionist rhetoric. The Bible’s pre-Christian “beginnings” are marked by a 19th century Torah. The placard indicates that the scroll is opened to Exodus 36 that details the construction of the wilderness tabernacle. Although not indicated in the placard itself, the tabernacle prefigures the sacrifice of Christ for creationists and other evangelicals, a clear example of supersessionist theology. Nearby is a large sign detailing the mission of Ezra who is said to have restored the people of Jerusalem to faith and to have read the Torah from a podium. It is hard not to see the displayed Torah and reading table as props for this sign. Clearly, modern Jewish liturgy and piety is appropriated for a Christian evangelical message while the story of Ezra’s restoration becomes a prototype for Christian missionary and revivalist activities. Also close at hand is another large sign that describes Paul’s conversion. This sign says that the mission of the Pharisees was to ensure obedience to the Law, but the Law had been supplanted by faith in the Messiah. I do not know if this sign is the work of the Museum of the Bible or Answers in Genesis, but to allow one’s authentic Torah scrolls to promote such a message undermines any claim to cultural sensitivity. The MOTB and the museums operated by AiG are best understood as part of a larger phenomenon of expressing evangelical theology and interpretation in museums. In these facilities, references to Israel and Judaism and displays of Judaica are not rare. These references provide background, illustrate theological points, and sometimes provide foils against which Christianity might be shown to be the “true” religion. The Creation and Earth History museum near San Diego was founded by the Institute for Creation Research in 1992. In 2008 it was acquired by the Life and Light Foundation, which is headed by a Jewish convert, Tom Cantor, who also operates a successful medical testing business, Scantibodies, and a missionary organization, Israel Restoration Ministries, that is directed at converting Jews. Scantibodies’s facility in Tecate, Mexico includes a 1500 seat auditorium/meeting place called the Tabernáculo de Tecate that includes a full-size replica of the biblical tabernacle. A similar addition was made to the Santee museum. The Tabernacle Theatre offers a full-size staging of the Exodus tabernacle complete with a mannequin priest. The audio-visual presentation makes plain the association between the wilderness sanctuary rites and the crucifixion of Christ. When I visited in January 2016, visitors were invited to take a plush sacrificial lamb to hold during the presentation as a reminder of Christ’s sacrifice. The supersessionist theology is unmistakable. One encounters a similar interpretation at Noah’s Ark Café and Bible History Museum in Oregon that has a more extensive, full size, tabernacle model. I am under the impression that this business has changed ownership since April 2016 when I found that the gift shop had a plush Rabbi with a “Jews for Jesus button” for sale. More relevant to the present purposes are the displays of Judaica at some other creationist facilities. The Discovery Center in Abilene, Texas, has recently announced plans to build a new “Miracle of Israel Exhibit” that will include ancient artifacts, while the Glendive Dinosaur and Fossil Museum in Montana houses a 300-year-old Torah scroll and a fragment of another that is 500 years old. Fig. 5. Part of the collection of Judaica at the Glendive Fossil and Dinosaur Museum, Glendive, Montana. The museum provides almost no information about the provenance of these artifacts. Photo by the author, Jul. 1, 2016. The Jew is the emblem of eternity. He whom neither slaughter nor torture could destroy; he whom neither fire nor sword, nor inquisition was able to wipe off the face of the earth; he who was the first to produce the oracles of God; he who has been for so long a time the guardian of the prophecy, and who has transmitted it to the rest of the world—his nation cannot be destroyed. The Jew is as everlasting as eternity itself. Besides appropriating Jewish scribal precision for Christianity, Jewish suffering becomes an analogy for the struggle to preserve the Christian Bible. These patterns can also be seen at the AiG facilities. As was the case with the Glen Rose museum, Answers in Genesis seems to capitalize on Jewish suffering. One fragment of a 300-year-old Iraqi Torah scroll at the Creation Museum is said to have been “Snatched from Saddam’s Clutches”. It then adds, “Efforts to destroy God’s Word have met similar resistance throughout history.” What happened to the Iraqi Jews who owned this scroll is not discussed. What was a small, symbolic, consolation victory during a period of great cultural loss for Judaism and personal tragedy for many Jews, becomes evidence of divine protection for “Biblical Christianity”. The Museum’s “poison” panel also says that while the first Christians faithfully transmitted the “unadulterated” divine word, later generations were not so scrupulous, although no examples of transmission errors are given. In general, the accurate transmission of the Old Testament is left up to the Jews. Answers in Genesis shows a familiar Christian ambivalence to Jews. They have been left behind by a tradition they can still be praised for preserving. Fig 6. Isaiah and Moses, AiG Creation Museum. Photo by the author, Oct. 1, 2016. 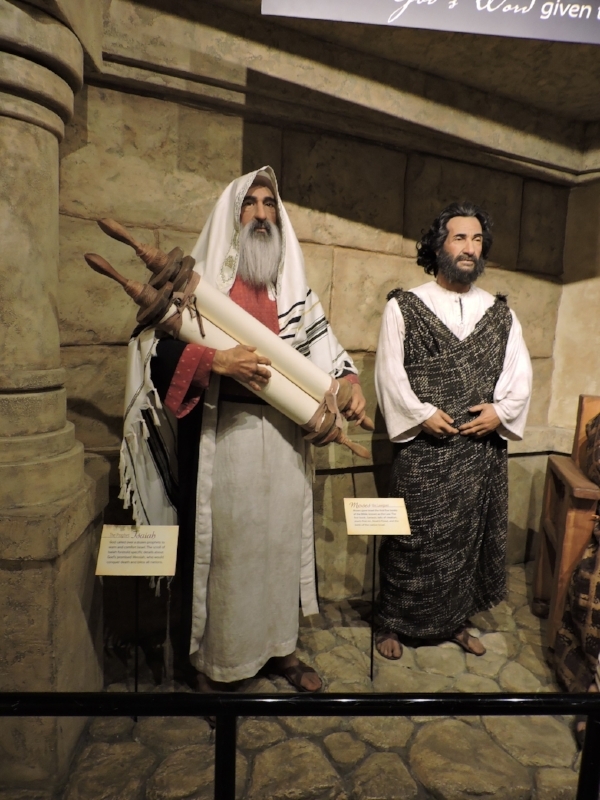 An interesting illustration of this ambivalence is shown by the Creation Museum’s life-size figurines of Isaiah and Moses. Isaiah is on the left with the tallit and scroll. The Moses figure in the dark robe once carried tablets of the Ten Commandments, but the ministry came under fire for some embarrassing errors in the tablets’ Hebrew. Moses’s placard says he gave Israel the “first five books of the Bible known as the Law.” It also provides a brief synopsis of Genesis. Isaiah’s sign reads, in part, “God called over a dozen prophets to warn and comfort Israel. The scroll of Isaiah foretold specific details about God’s promised Messiah.” While the sign does not say that faith in the Messiah replaces Moses’ Law, this seems to be a clear implication. In fact, the exhibit says nothing about the Law as a set of commandments. Next to Isaiah’s messianic scroll of prophecy, the Law is so irrelevant to AiG that the flawed display tablets representing them did not even need to be replaced. All the visitor needs to know is that Moses gave us Genesis. Over and against the “books” of Moses, AiG refers to the “scroll of Isaiah,” a word choice that alludes to the great Qumran Isaiah scroll, whose textual accuracy the ministry and a host of other creationists extoll. There is a “bait and switch” tactic going on. The word choice and imagery of the scroll, along with the prophet’s tallit, evokes Jewish piety but applies it to messianic prophecy. Similarly, at the Museum of the Bible, the 30-minute interactive Hebrew Bible audio-video tour almost totally ignores Sinai and the Law, spending more time on Ruth. As Jill Hick-Keeton has commented, the MOTB supplants the texts of ancient Israel with the trappings of the Christian Bible when discussing the origins of the Hebrew Bible. It is also important to note that Answers in Genesis is particularly silent on Jewish suffering caused by Christians. One sign at the Creation Museum declares that some people justified slavery through “distortions” of scripture, but the visitor gets no sense of the extent of Christian antisemitism. While Martin Luther’s emphasis on sola scriptura is celebrated as a restoration of true Christianity, his denouncements of Jews and Judaism go unmentioned. No artifacts point to violence incited by Christian anti-Judaism and antisemitism. Instead, racism, in all its forms, is the result of putting human thought above the divine word. “Evolution” is the epitome of such hubris, and the genocidal policies of the Nazis are said to have been “perhaps the most infamous application of evolutionary theory to justify racism”. Fig. 7. Nazi Artifacts. Photo by the author, Oct. 1, 2016. The sign describing these items quotes Arthur Keith’s Evolution and Ethics from 1947 that affirms that the Nazi racial program was motivated by evolutionary thought. Such indictments of evolutionary theory and its role in Nazi ideology deflect clear-eyed appraisals of Christian anti-Semitism. To sum up, at the AiG venues Jews and their history are little more than pawns in the ideological struggle with religious plurality, the forces of secularism, and liberal Christianity. AiG’s Bible is not the pluralistic one of scholarship and interreligious dialogue. As one sign in the Creation Museum puts it, “The Prophets, the Apostles, and Jesus Christ proclaimed one truth.” Anyone who objects to their evangelical and young Earth creationist Christian statement of faith will not be hired. The Museum of the Bible has included rabbis and Jewish scholars in their International Advisory Council. But it is hard to see how an honest desire to be inclusive of Jews would permit association with ministries like Answers in Genesis. And so, I must ask whether Answers in Genesis is an organization that the Museum of the Bible, with its interest in the history of the Bible as a cultural artefact and a stated desire for inclusivity, should continue to partner with. See the list at http://contemporarycreationism.com/creation-museums/. A definitive list is difficult to make. Many of these facilities are very small, serve only a local congregation, or have very little presence on the internet. Closures and relocations are not infrequent. Whether these venues are properly labelled as “museums” is an issue that is beyond the scope of this paper. Mark Looy, “Rare Biblical Manuscripts on Display at Creation Museum,” Answers in Genesis (Oct. 18, 2012). Online, https://answersingenesis.org/about/press/rare-bible-manuscripts-on-display-at-creation-museum/. Accessed Jan. 10, 2018. Ken Ham, “Museum of the Bible Opens in Washington, DC,” Ken Ham’s Blog, Answers in Genesis (Nov. 18, 2017). Online, https://answersingenesis.org/blogs/ken-ham/2017/11/18/museum-bible-opens-washington-dc/. Accessed Jan. 10, 2018. David Abrahams, “Judaism” in Bodie Hodge and Roger Patterson (eds. ), World Religions and Cults: Counterfeits of Christianity (Green Forest AK: Master Books, 2015), 213-232. Candida R. Moss and Joel S. Baden, Bible Nation: The United States of Hobby Lobby (Princeton: Princeton University Press, 2017),143. Moss and Baden, Bible Nation, 143. See, for example, Andrew A. Snelling, “Noah’s Lost Word,” Answers in Genesis (May 3, 2015), Online, https://answersingenesis.org/geology/plate-tectonics/noahs-lost-world/. Accessed Jan 11, 2018. “Dragon Slayers: A Tremendous Trio,” Answers in Genesis. Online, https://creationmuseum.org/bible-history/museum-of-the-bible/. Accessed Jan. 10, 2018. Moss and Baden, Bible Nation, 142, observe how the MOTB does not acknowledge its cooperation with AiG at its either physical location or on its website. “Scholars Initiative”, Museum of the Bible. Online, https://www.museumofthebible.org/research/scholars-initiative. Accessed Jan. 22, 2018. Moss and Baden, Bible Nation, 142. This body includes Christians of diverse denominational affiliation and Jews. “Overview: International Advisory Council,” Museum of the Bible (Oct. 13, 2017). Online: https://www.museumofthebible.org/press/background/overview-international-advisory-council. Accessed Jan. 21, 2018. Lindsay Marie Barone, 2015. The New Pulpit: Museums, Authority, and the Cultural Reproduction of Young-Earth Creationism (PhD Diss., University of Wisconsin-Milwaukee, 2015), Larissa Soares Carneiro, Divine Technology: How God Created Dinosaurs and People (PhD diss., North Carolina State University, 2016), Julie Homchick, Displaying Controversy: Evolution, Creation, and Museums (PhD Diss., University of Washington, 2009). Kathleen Curry Oberlin, Mobilizing Epistemic Conflict: The Creation Museum and the Creationist Social Movement (PhD Diss., Indiana University, 2014), Steven Mark Watkins, An Analysis of the Creation Museum: Hermeneutics, Language, and Information Theory (PhD, University of Louisville 2014). Jeffrey Steller, “The Creationist Tales: Understanding a Postmodern Museum Pilgrimage,” in Stanley D. Brunn (ed. ), The Changing World Religion Map, (New York: Springer, 2015), 2541-2561. John Lynch, “‘Prepare to Believe’: The Creation Museum as Embodied Conversion Narrative,” Rhetoric and Public Affairs 16 (2013), 1-28. Israel Restoration Ministries. Online, http://www.israelrestoration.org/irm-ministries.html. Accessed Jan 10, 2018; Creation and Earth History Museum. Online, http://www.creationsd.org/museum_history.html. Accessed Jan 10, 2018. Tolstoy is quoted second hand from James and Marti Hefley, Where in the World Are the Jews Today (Wheaton Il: Victor Books, 1974), 30. E.g. 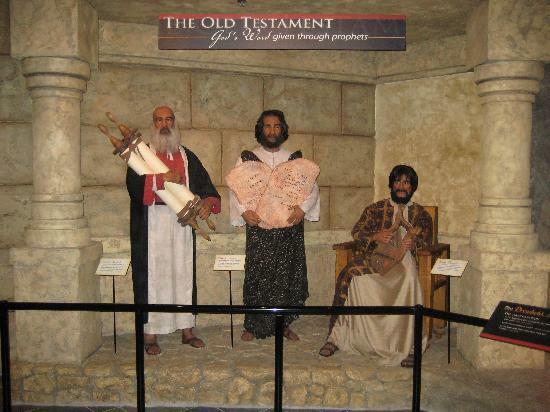 Ben Stanhope, “A Seminary Student Visits the Creation Museum: 27 Million Dollars of Bad Exegesis,” Remythologized Blog (June 15, 2013). Online, http://benstanhope.blogspot.ca/2013/06/a-seminary-student-visits-creation.html. Accessed Jan 11, 2018. Stanhope provides two photos of the figurine with the tablets. E.g. Ken Ham, “Why were the Dead Sea Scrolls Important?” Answers in Genesis (Mar. 4, 2016). Online https://answersingenesis.org/media/audio/answers-with-ken-ham/volume-120/why-were-the-dead-sea-scrolls-important/. Accessed Jan 10, 2018. It is possible that the tallit is a secondary addition. A photo on the TripAdvisor site shows the figurine without the shawl while Moses holds the tablets: https://media-cdn.tripadvisor.com/media/photo-s/01/50/12/37/prophets-of-the-old-testament.jpg. Besides her presentation to the AJS panel, see also Jill Hicks-Keeton, “Can Scripture ‘Speak for Itself’? Inside the Museum of the Bible,” Religion and Politics (Nov. 17, 2017). Online, http://religionandpolitics.org/2017/11/17/can-scripture-speak-for-itself-a-look-inside-the-museum-of-the-bible/. Accessed Jan 3, 2018. Stern, Mark Joseph, “Non-Christians Need Not Apply,” Slate (Oct. 27, 2014). Online, http://www.slate.com/articles/news_and_politics/jurisprudence/2014/10/ken_ham_ark_encounter_theme_park_religious_discrimination_may_block_kentucky.html. Accessed Jan. 12, 2018. “Overview: International Advisory Council,” Museum of the Bible (Oct. 13, 2017). Online, https://www.museumofthebible.org/press/background/overview-international-advisory-council. Accessed Jan 12, 2018. James Linville is an Associate Professor in the Department of Religious Studies at the University of Lethbridge in Lethbridge, Alberta, Canada. His original training has been in Hebrew Bible and has worked on theories of myth relevant to the study of ancient Judean and Israelite writings and the biblical prophetic corpus in particular. His new project is directed at the myth-making processes within the young Earth creationist movement that combines biblical interpretation, creation science and social commentary.